Its around this time every year that Jadee Jones relives the magic in his mind that took place right in front of his eyes four years ago. Jones had watched the Final Four, and the ensuing national championship game, on television for years and soaked in the massive spectacle from afar. (It) was like we were watching a movie and not real life, Jadee said. Thinking back, I cant believe thats how it went down. And he would shine at every stage — Team USA tryouts, gold medal games, Jadee said, all the way to the national championship. He always surprised me, even though I probably shouldnt have been surprised. We just knew what he was capable of because we have seen it many times before, said Tyus mom, Debbie Jones. The former two were more touted prospects who would go much earlier in that summers NBA draft. But Jones was Dukes go-to guy when the stakes were highest. Quinn Cook, Jones backcourt mate at Duke, has the receipts. Duke needed it in the title game. Jones scored six points in the first four minutes of the second half to keep the Blue Devils within reach. Still, Wisconsin led by nine with 13 minutes to play. Trailing by two with just more than four minutes left, Jones buried a triple to put the Blue Devils on top for the first time all half. Nearly three minutes later he took nearly the same shot — coming off a screen at the top of the arc — and drilled it again, this time to put Duke up eight, all-but sealing the national title. It was the same type of shot Debbie Jones had watched her son practice hundreds of times in the past. As Jones hit the shot, he dropped his hands to his side and roared as he looked out into the crowd and made direct eye contact with Jadee. Photographer Greg Nelson captured the moment when the two brothers seemed to lock eyes. The photo appeared on the cover of Sports Illustrated the following week. I was thinking We just won the national championship. We just accomplished what our goal was from summer school workouts, conditioning workouts, all the hours in the weight room, lifting and all that, Jones said. I was just thinking we were able to say, We did it. The freshman guard scored 13 of Dukes final 21 points, including a pair of free throws that truly iced the game in the final minute. 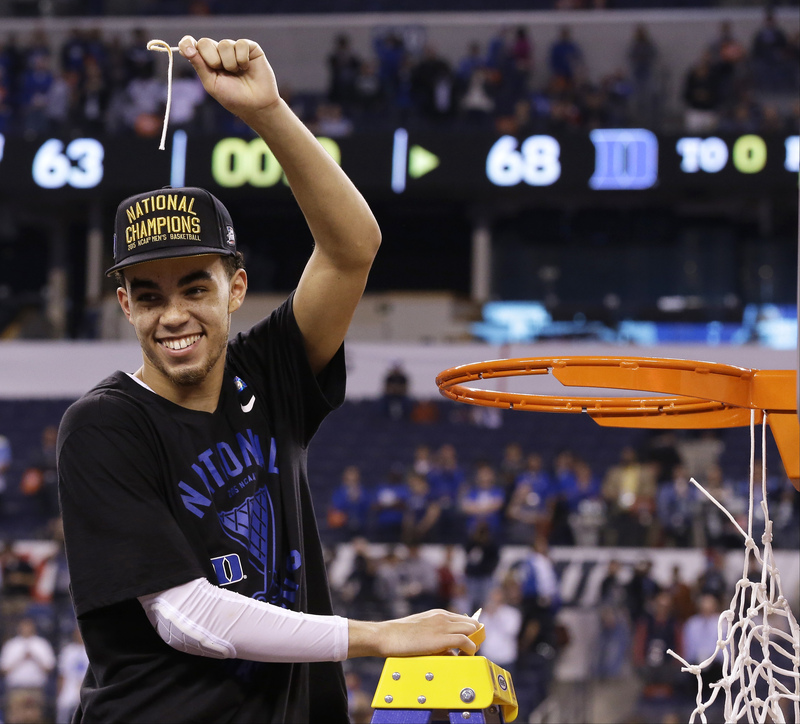 It all culminated in Jones earning the distinction of the Final Fours Most Outstanding Player. Debbie Jones called the entire NCAA tournament incredible, from the experiences to the emotions. But maybe the most memorable moments came in the hours after the national title. People gathered in the streets for blocks outside of the hotel. Eventually, the family sneaked Tyus into a service elevator to return to the hotel room for the family to decompress. Only then did the nights events truly sink in. Jadee said it was a dream of Tyus to be a one-and-done player who left for the NBA draft after his freshman season, but it wasnt something Jones was actively pursuing. All year at Duke it wasnt talked about, because I think Duke is such a good place to be, there was no rush to get out of there, Jadee said. Once the next level was ready to accept him, he would go. But until then, he was in a good spot and didnt need to worry about having to get out of there, having to extract as much value as possible. The longer youre with Coach K and Duke, the better. His stock was never going to be higher than after that championship, she said. Tyus entered the NBA draft and was selected 24th overall by Cleveland as part of a draft-night deal that sent him to his hometown Timberwolves. The memory of that Final Four run, and his championship performance, wont soon be forgotten. To this day, Tyus is often still referred to as Tyus Stones, which even then-President Barack Obama used when Duke visited the White House. Debbie made many trips back to Durham this year to watch Tyus younger brother, Tre Jones, Dukes current starting point guard who has the Blue Devils in Sundays Elite Eight game against Michigan State. Years later, Jadee fully appreciates the scope of that run and what it meant for his brother to be the hero on one of Americas grandest stages in sports. Its one thing for a guy like Carmelo Anthony, who had all the physical tools in the world and went on to be one of the NBAs great scorers, to have that type of moment at Syracuse. All the way around, it seems like someone else wrote the script, Jadee said, as opposed to it unfolding like that in real life.